Second edition of Amateur Champions Trophy (ACT) T20 will commence at three different venues in the capital on October 12. Defending champions and Bangladesh Premier League (BPL) franchisee Rangpur Riders is organising the second consecutive edition of the tournament. Bashundhara Group Vice-Chairman and Rangpur Riders Managing Director Safwan Sobhan Tasvir disclosed the timeline of the second edition of ACT during an event at United City Farm House in Satarkul of Badda on Thursday. In the event, he also unveiled the trophy and jerseys of the individual teams. Rangpur Riders Chairman Mostafa Azad Mohiuddin, Chief Executive Officer Ishtiaque Sadeque, Executive Director Dr Anwarul Iqbal Mitu, captains of all sixteen teams and other officials of Rangpur Riders were present on the occasion. 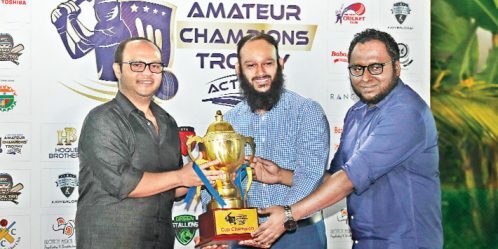 The teams will participate in ACT this year, under four groups, at three venues in Dhaka, namely City Club Ground in Mirpur, Gulshan Youth Club Ground and Dhaka University Central Ground. The teams are MAE Warriors, Laila Cricket Club, Tech Republic, Commonwealth Cricket Club, SPG Boys, Red Court Cricket Club, Haque Brothers, Travel Booking Bangladesh, Bengal Tayj, Kazi Kings, Total Tiger Cricket, Dhaka Indians, Rancon Cricket Club, Gulshan Youth Club, KC Superstar and Green Sailings. Amateur cricketers can participate in the tournament despite it being arranged with the focus on the former cricketers. “Our main objective is to promote cricket, especially amateur cricket,” Safwan Sobhan said during the event. He reiterated his aim of improving the state of domestic cricket of Bangladesh. “We want to bring them (amateur cricketers) on a single platform. The cricketers who are playing in this tournament used to play cricket regularly once upon a time. But now they don’t have that opportunity. We want to enrich our domestic cricket by accommodating them such platforms,” he added. 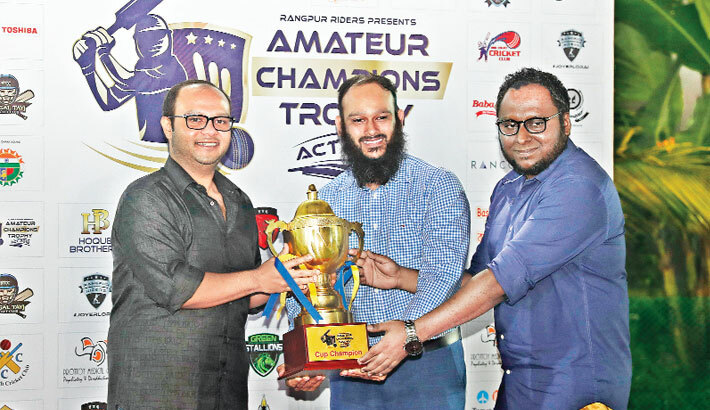 Later in the event, Rangpur Riders Executive Director Anwarul Islam Mitu said the next edition of ACT will be held in Cox’s Bazar and later iterations of the tournament will be organised overseas. In ACT 2018, the champion team will be awarded two lakh taka while the runners-up will receive one lakh taka, apart from the trophies. Safwan Sobhan handed over the champion’s trophy and cheque of one lakh fifty thousand taka to the captains of the two finalists of the last season. MAE Warriors and Tech Republic were jointly crowned the champions of first season of ACT. A total of 12 teams played in the first edition of ACT.